While the esports and game sides of League of Legends continue to chug along, there was one release that caught my attention: Ryze, the Rune Mage. While his kit is definitely interesting and merits some discussion, there was a (less heralded) release of Ryze’s lore and biography. This is just one more step in Riot’s attempt to completely overhaul their lore and the world of League of Legends. Two years ago, they announced that the core premise of the game was gone. There was no more League of Legends, no more Summoners, and the Rift was simply a Super Smash Brothers style place for the all stars of Runeterra to gather and fight, with no more actual weight to those games. Never again would there be something like the Noxus vs. Ionia match, or biographies written around the fictional League. However, this new announcement also opened many paths. Riot’s attempts to completely rebuild the lore are fascinating because they mirror many other aspects of League’s development. Let’s take a look at the process. If League’s problems as a game can be summed up in one word, it definitely has to be debt. We’ve seen debt come up again and again, usually in the context of tech debt, or server debt. The concept is simple: League grew faster than they could build the infrastructure for it, and so Riot has had to work around that with loopholes and hacks and workarounds. When the team does something like completely re-code skillshots, it's to try to pay down some of that technical debt and create a new foundation for future content. Just as the technical and design side of the game is drowning in debt, so too is the lore. Consider, for a moment, that there are still at least a dozen champions that have lore deeply rooted in the League of Legends that existed pre-retcon two years ago: Fiddlesticks is still the executioner of the League, Nautilus is searching for answers as to his betrayal and original mission, Brand is enslaved by the League, Jax is built nearly entire around the League and its history, and the League is the only place that could accept Lulu. The fact is, while Riot is getting out new biographies, faction lore, information on the regions, and events like the War in the Freljord, the history of the Shadow Isles, and the two Shurima events, there’s still a massive backlog of years of old lore that has to be updated, discarded, or rewritten. Riot is building a plane while it’s in the air and praying it doesn’t crash. The lore isn’t attached to the game anymore, but there’s still a necessity to keep it parallel with what’s going on. “Events” have to be lined up with in game releases. This isn’t necessary, but it’s a dramatically superior approach. Riot has released minor lore updates and bios quietly without it being part of an event, but it rarely garners the same amount of hype. There are good reasons why the event structure is working so well for Riot’s new lore updates. First, Riot gets to release a lot of new content, to a lot of hype. Sejuani and Trundle were updated along with the Lissandra release, Howling Abyss came out, and the Three Queens icon event ran at the same time. The Freljord event was a huge success for Riot in terms of storytelling, updating to modern design standards, and player interest. Second, successful events allow Riot to build off them for future content releases. Braum had a very coherent, consistent lore that was built up through teasers that could only exist thanks to the Freljord event and lore overhaul. Taliyah’s release similarly benefitted from the Shurima event, allowing us to see how this young woman was inserted into a war between a tyrant and a God-like being. While Riot has made significant headway with League of Legends’ lore in the two years since their retcon, they still have a long way to go. They need to overhaul a massive chunk of champion lore and profiles, and figure out what the regions of the world looks like. Bilgewater, Shurima, and the Freljord are all well developed at this point, and Targon got a lot of love with the Aurelion Sol release and Taric rework. But what of the foundational trio of Ionia, Noxus, and Demacia? What of Nami, the moonstone, and Fizz’s lost empire? Where is Katarina’s father, and what of Swain’s takeover as Grand General? The only answers that Riot can give right now at the moment is a sly wink, a nod, and an encouragement to ‘wait and find out’. When we’ve already been waiting years for an answer, this is frustrating. Heck, where’s an archive where I can read all the existing canon with a few clicks? In many ways, being a fan of Riot lore feels like getting waking up on Christmas morning to get the second book in a fantasy series from your well meaning aunt. You have a lot of questions, but you finally get invested and prepare for what’s next. Then, on your birthday, you get a book shaped package from your aunt. Your heart singing, you open it, only to find... Book two, of another fantasy series. Well, all right then, you think, and eventually you just stop caring. Realistically, this is about more than just artistic integrity to Riot. They make money off having strong lore: it is an incredibly strong marketing tool, first of all, and that extends beyond the main story. 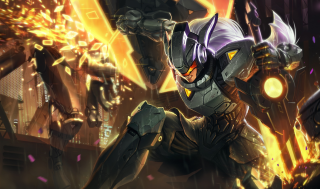 The PROJECT skin line is one of Riot’s best sellers, and the lore (hinted at in the Overdrive mini-movie and legendary voice lines) contributes to that. The Warcraft movie’s incredible financial success is another incentive for Riot to get their stories in order, if they want to replicate such a feat. They’re likely up to the challenge, but this the list of tasks at hand could fill a book of its own.